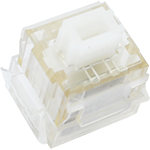 Matias' Standard Click Switches are a respectable Cherry alternative in White ALPS form. In terms of feel and sound, a cross between Brown MX and Blue MX. Excellent switch, apart from the limited availability I'd say they're better than an MX blue switch in every way except for their rather lackluster durability. The real tactile din bump, a recoil under the fingers, great satisfaction !!! A very faithful recreation of the old Blue Alps switches. Crunchier and sharper than White Alps, not as crunchy as Amber Alps. Have experience using Matias Click switches? Add a review to share your knowledge with the keyboard community.